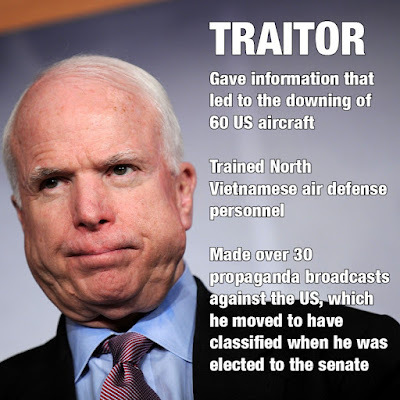 John McCain -- a former Vietnam prisoner of war, 6-term U.S. Senator from Arizona and 2008 GOP Presidential nominee who battled an aggressive form of brain cancer in the latter part of his storied career -- has died ... TMZ has learned. 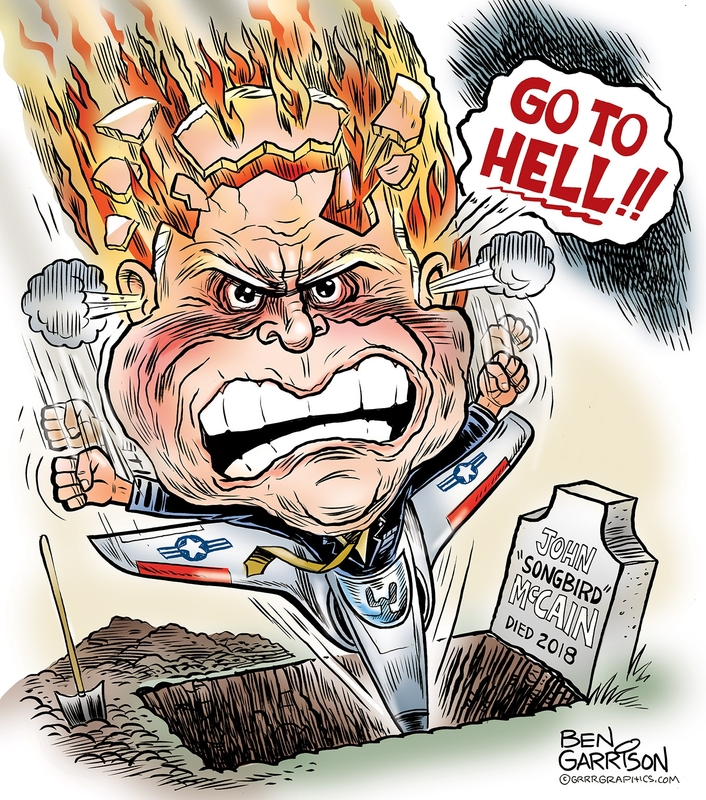 McCain was diagnosed with glioblastoma back in July 2017 ... the same type of cancer that took the life of Senator Ted Kennedy back in 2009. 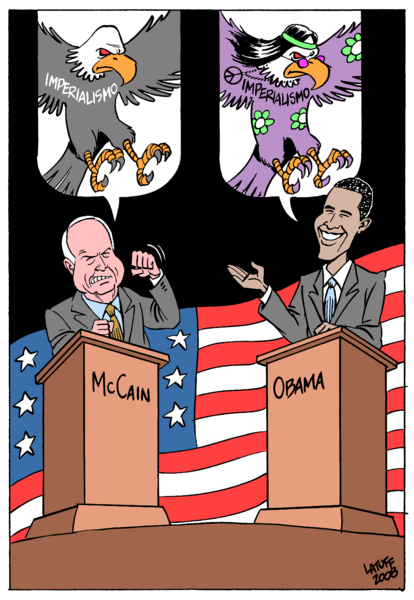 McCain took some time off to fight the disease but continued chairing the influential Senate Armed Services Committee. Most notably, he returned just a week after his brain cancer diagnosis to cast the deciding vote that killed President Trump's attempt to repeal Obamacare. The vote came as a huge surprise, to say the least, and added another wrinkle to the testy relationship he had with Trump. 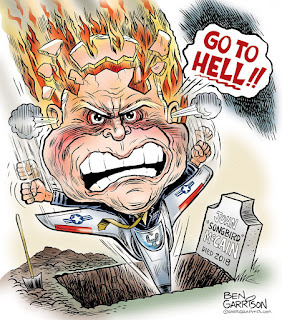 McCain said he did NOT want Trump attending his funeral. 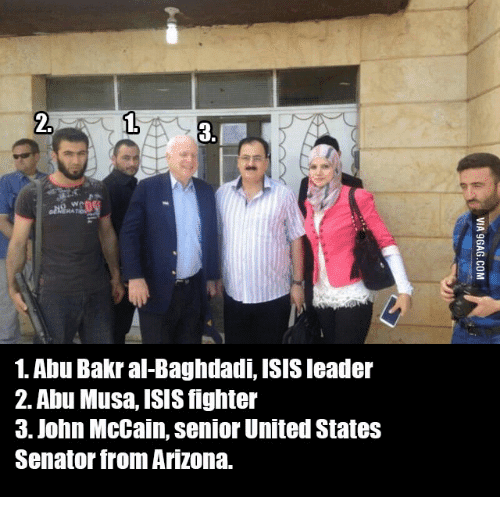 This is but a small list, read the article for the analysis, however McTumor quite actually funded ISIS and supported every war to kill as many Native American Patriots as possible! That's just the beginning, "Our Hero" killed 100's of Americans during his time of "service"
This stunt and aftermath caused the deathof 134 sailors and seriously injure (blow off arms legs, cause blindness and burns to another 161 sailors) and took the ship off the battle line for extensive repairs. Any other Navy pilot causing this type of death and destruction the Navy would have raped him and he would probably still be in the brig. Why not McCain? Well, first with many powerful connections this “little infraction” was covered up by the Navy (our most politically involved/connected service by the way). Thank God the "XXXX" is dead!